The $1.00 Columbian, depicting "Isabella Pledging Her Jewels," is based on a painting by Antonio Munce-Degrain. The vignette was engraved by Robert Savage, the frame by Douglas S. Ronaldson and the lettering by George H. Seymour. 55,050 stamps were printed and an unknown number were destroyed and never issued. The $1.00 is very rare as a top plate block. Most plate blocks are from the bottom position, and many have narrow selvage. Notable name sales such as Fogelson, Eno, "MLG" and Wampler, did not contain any top plate blocks. 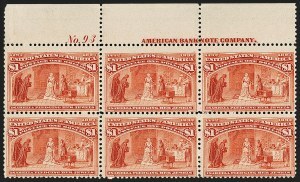 The Weill Stock sale contained a sheet of 100, with two bottom plate blocks. 6) Bottom left plate no. 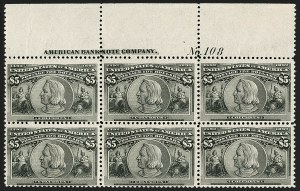 105 block of six, original gum, Miller collection, The New York Public Library, unavailable to collectors. 3) Bottom left plate no. 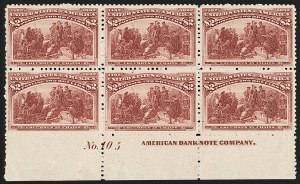 106 block of six, narrow selvage, no gum, top left stamp slight thin, ex Franklin J. Willock (Harmer, Rooke sale, 1/13/1953, lot 429), 1980 Greg Manning, 2004 Shreves Philatelic Galleries. 3) Bottom left imprint and plate no. 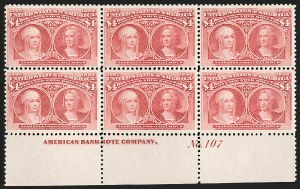 107 block of six, five stamps Mint N.H., sound and Extremely Fine, ex Col. Stillwell and Kobacker, offered in this sale. 4) Bottom right plate no. 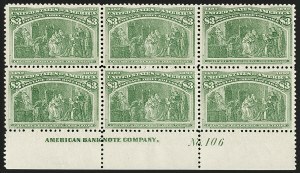 108 block of six, narrow selvage, ex T. Charlton Henry (Harmer, Rooke 12/14/1960, lot 606), "World's Fair" (Sale 1055, lot 62).